Glendowan FC Under 14 Captain Kevin Farrelly with the National League U14 Trophy. Local side, Glendowan FC U14s secured the National league B division title on the last day of the season recently, pipping Irish League giants Glentoran and Crusaders to top spot. The locals won the league over 26 games with 20 wins, 5 draws and 1 defeat with 65 points to Glentoran’s 64 and Crusaders’ 63. Having led top spot from November, this young team were determined to finish up champions come May, to earn promotion to the A division for next season. 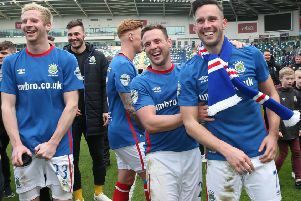 In addition to this the team complimented its great league form with two great cup runs, losing out to Linfield in the NI Cup and the National League Cup semi finals. The team travelled to Denmark for 6 days to play in the Norhalne Elite Cup sharing a flight with English academy sides West Brom, Millwall & Leyton Orient. The tournament featured 32 teams, 31 being professional clubs from Sweden, Denmark, Holland & England with Glendowan FC the only Amateur club. The locals eventually finished 4th having been beaten in the 3-4th playoff to Swedish side Brommaapojkarna. Eventual winners West Brom were great to watch and the lads learnt a lot from watching this EPL academy side. The trip was rounded off with great news when the club was approached by the head of Leyton Orient’s Academy offering to take captain Kevin Farrelly on trial to London in August with a view to 2 more players being brought across. Leyton Orient have also offered to link up with Glendowan FC with an official affiliation with the English club on the cards, to create a player pathway for talented young players at Glendowan FC to travel over to Leyton Orient on trial. Overseeing this will be Glendowan FC 99s Manager Paul who will travel to Leyton Orient in August to see the club’s Academy setup and philosophy before being put through a Talent Identification crash course to become an official Leyton Orient Scout for the North of Ireland. Any new players interested in joining this up and coming squad please contact coach Paul Delaney on 07852200160.